Although some of the world already reached the rapture moments, exactly which time zone at 6 p.m. the rapture and Zombie Apocalypse (or Global Reanimation Block Party) might be destined to begin still may not be clear. After all, the man who predicted doomsday and the beginning of the end of the world — in fact, he guaranteed it — is located on the U.S. West Coast, which means I might not see it until 9 p.m. Eastern time. 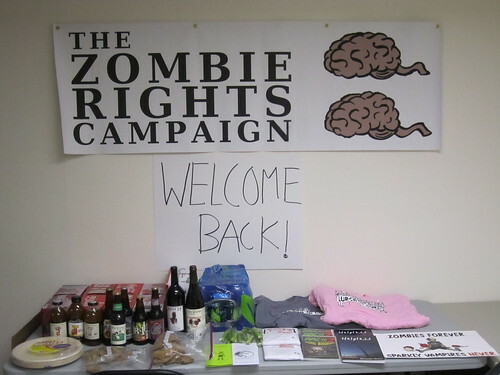 With apologies to the Zombie Rights Campaign, I feel it my duty to plan for all contingencies. As you have probably heard, the U.S. Centers for Disease Control provided a guide in case the Global Reanimation Block Party does occur. John Sears, President of the ZRC, wrote a response to the CDC’s preparedness plan. Any gun or rifle with large magazines and hollow-point bullets: This is, of course, if you find the Zombies unfriendly and involuntarily attempting to convert you while you’re attending the Global Reanimation Block Party and you’re enjoying a cool beverage. Mr. Sears already has posted some photos showing the party set up and it looks lovely. I’m certain his gathering will be just fine but if you happen to be at one less welcoming and more chomp-chomp, such guns help and, as suggested with Zombieland Rule #2, always remember the double-tap. Double-barrel shotguns: The problem with these are always reload time and carrying all that extra ammo. But these shotguns are highly effective if aimed properly. Axes and hatchets: Since weapons like guns may not be handy, axes are effective. In fact, might I suggest today you get in some practice time. For the little ones, hatchets can be an effective alternative to wielding something quite so heavy like an ax when Mommy and Daddy are busy hacking up a swarm of PTA-infected Zombies still pissed your parents didn’t want to support every child getting a trophy at the talent show. Swords: For those of us never laid or know what LARPing might be, you’ll finally draw blood, although it might be a little stale since it hasn’t pumped in a while, depending on how recently Undead the Zombie has been. However, those of you with swords might consider a Zombie bite an alternative lifestyle option, since you’re not getting any alive, you might try the Undead. [/unordered_list]Please keep in mind that with all these, you can choose to maim rather than kill as a warning to the Differently Animated. I’m certain the ZRC will disapprove of all of this. However, I feel a civic duty to provide this service. Better to be safe than sorry on this Rapture Day. Enjoy. If we survive the Global Reanimation Block Party, I’d really appreciate it if everyone would consider tweeting original content starting on Sunday, May 22. Of course, that’s a big “if.” Even if you include just once in your tweets during the week #RTFreeWeek, that would be terrific! Thanks!